During Mercedes-Benz Fashion Week Swim five top designers fell in love with ex-model Kim D’Amato all over again. But instead of D’Amato gorgeous face, heads were turning from the great nail colors of PRITI. 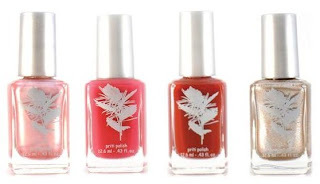 PRITI in Sanskrit meaning with love, or pleasure sensation has a complete non-toxic nail polish line designed and specifically named after beautiful flowers, and plants that they resemble like; Magic Man Iris, China Pink Tulip, White Ballet Dahlia, and Shirley Temple Peony. PRITI nails are fast drying, chip resistant, and super glossy which was the buzz in Miami. PRITI also makes a soy nail polish remover, making it safe for the little young divas and even expecting mothers to be. PRITI nails were definitely a show stopper on the runway this summer. With a variety of great colors, I am sure you can find the right shade for you for any season.